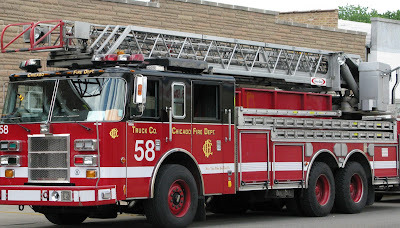 Every goddamn day: 04/19/19: Chicago Fire Week # 1: "I asked God to send the angels"
Chicago Fire Week # 1: "I asked God to send the angels"
I realized I haven't used any vacation in 2015, so took this week off at the paper. A break which will be undercut if I keep busy here. But I didn't want to leave you folk with nothing. I was puzzling over what to do, on the elliptical at the Y, listening to Bonnie Tyler's 1980s chestnut, "Holding Out for a Hero." 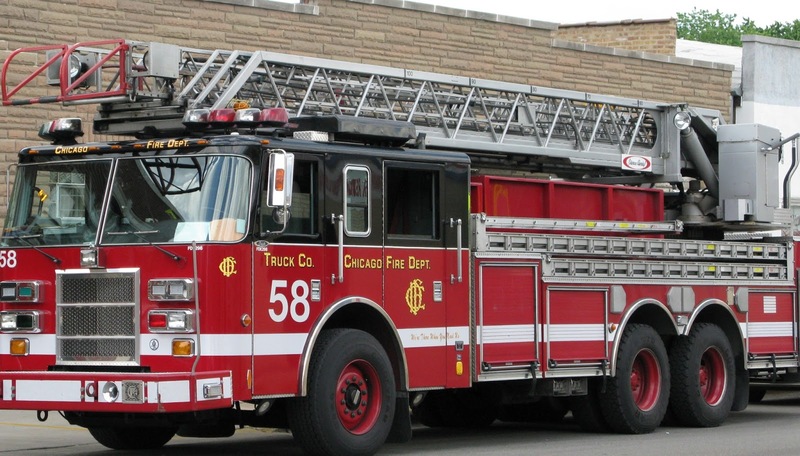 Heroes made me think of firefighters, and I realized I could run some columns about the Chicago Fire Department, which are by nature thrilling, and some of my favorite stories. Plus they're so rare. Being actual heroes, fire fighters don't like to talk about their exploits. It strikes them as bragging. The column below would never have happened had the minister not forced the guys to talk. There is also, I believe, paradoxically, a certain timidity at work too. Firefighters, like cops, work in close quarters, in an unfair, rigged hierarchy where personal initiative can be punished: you don't want to stick out. It's safer not to talk to a reporter, ever, about anything. So five days of fire stories this week—I might jump in on an issue, but only if I feel inclined. Otherwise I'm reading in the hammock, gardening and, I imagine, doing various chores around the house. I hope you like these, because if a reporter can't do something engaging about a fire, he's in the wrong business. The only downside is I don't have any good fire photographs. The one atop the blog is from Wikicommons, courtesy of Wesha. If you have a good one, send it to me, and if I use it as a header, I'll give you credit, and pay you 20 bucks. When a church burns, it's usually a goner. Old woodwork ignites like tinder. Cathedral ceilings hide spaces where fire spreads undetected. Plaster falls in heavy chunks, shattering oak pews. One beam goes and the whole ceiling pancakes down, walls collapsing outward. St. John United Church of Christ, a small, 90-year-old brick building on Moffat Street, its modest congregation bolstered by hundreds of recovering alcoholics, seemed doomed in the pre-dawn darkness last Jan. 20. When Engines 43 and 57 and Trucks 28 and 13 of the 6th Battalion arrived, fire had blown through the third-floor choir window, and flames were flapping out. Yellow-green smoke poured from the eaves. The vehicles were met by the pastor, the Rev. Charlotte Nold, standing before her burning church. "I live next door," she explained. 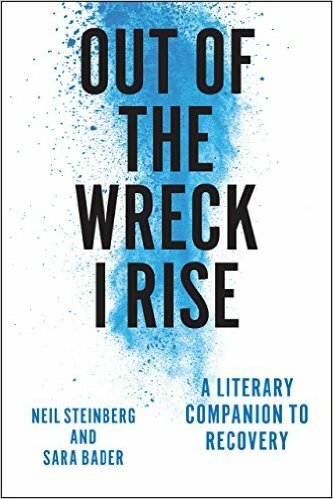 "My phone rang, the doorbell rang desperately, and I heard the fire engines all at the same time. I stood in the snow, and I just prayed. I asked God to send the angels." Chief Walter Steinle wasn't optimistic about the church's chances. "Most of the time when we have a church fire, if it gets into the loft area, it's normally lost. It's nothing but a lumberyard up there." 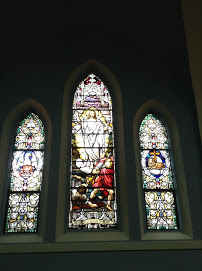 Through the smoke, the chief noticed the church's 20 beautiful German stained glass windows and hated to think they might be destroyed in the effort to save the church. "I told them, let's not break any windows," Steinle said. As hoses were run out, Engine 43 hit the fire with its deck gun, pouring 500 gallons from its reserve tank — "quick water" as firefighters call it — attempting to knock down the fire while the hydrants were opened. That took longer than usual. The first hydrant was frozen — it was 11 degrees that morning — so Ron Szatkowski hustled to find another. Other firefighters rushed to find the quickest way into the church. "Churches have got those big doors; there's no way to get in there," Lt. Anthony Rodriguez said. "We had to go in through the window that the fire was coming out of. We put up ladders, and guys went up the ladders. It was a real dangerous situation. Churches are notoriously treacherous. They are full of secret passages and lofts. Firemen get up there and get lost within the ceiling. A real dangerous situation." Particularly for firefighters Angelo Rodriguez and Joseph Kish, crawling on a board at the peak of the church, in the false section between the plaster ceiling and the roof, dragging a 1 3/4-inch hose. "I went up with a charged line, crept up through the scuttle hole into the cathedral ceiling," Rodriguez said. "I was over the cathedral ceiling, inside the crawl space. It was hot, where we hit the ridge of the church's roof, and downward toward the wall. One false step and I was through the dry wall and about 50 feet to the floor." Meanwhile, firefighters Brad Wilson and Ed Datz scrambled up the slate roof, icy and pitched at a dizzying angle. Clinging to a roofer's ladder, they broke holes in the slate with sledgehammers, then chopped through the roof with axes to let the smoke and heat out, probably preventing the roof from collapsing. Busting the windows would have helped, too, but Steinle had given an order. "He saved those windows," Lt. Rodriguez said. "In the heat of battle, firemen do what has to be done. But the chief said that bad things would happen to us if we broke those windows." The ceiling was a total loss. Smoke damage stopped precisely at the top of the windows. Restoration took nine months and cost about a million dollars. Last Sunday, the congregation rededicated its building. And despite the firefighters' reluctance to be honored for doing their job, members of the 6th Battalion were on hand. "The minister is pretty persuasive," Steinle said. "We don't normally do things like this. We don't normally bask in the light. We're happy to save any building. But being an edifice of God, it made us feel good." How did Nold persuade the humble firefighters to come to her church to be hugged and honored? She put it in a way they couldn't refuse. "I talked to Chief Steinle and told him I wanted them to come, to thank them, and give a presentation," she said. "I could see in their eyes they felt shy. I said, 'We're a small, inner-city church. We work round the clock dealing with poor people, tragedies, chaos and the homeless. We need you to come tell my congregation that you cared to save the church.' "
The firefighters — who received a unit performance commendation from the department— credit teamwork for saving the church. Nold has a different idea. She never worried that the church would be destroyed. "No, and I'll tell you why," she said. "I could feel the angels. I could actually feel the angels. I knew the angels were inside the church. I didn't think the whole church would burn. I knew there were too many angels in there. Both real angels, and the firemen, acting like angels." Postscript: I phoned the church to see if Rev. Nold is still there: she is, 27 years on the job. She did say that the facade of the church needs expensive repairs, and its future is uncertain. The plan now is to sell three of the four lots it sits on and use the money to build a new, smaller urban church on the fourth lot, of course transferring the German stained glass windows into the new building. I was going to comment on the column in ST you have in on Monday on the elderly gentleman but I see it's not up yet. Enjoy your vacation. Surprised you aren't traveling. I'm going to post that one next Monday, which is Ed's actual birthday. I hope Ed doesn't peruse these comments -- methinks he would be offended by the "elderly" reference. Maybe you are offended by the elderly reference, Tate. I didn't know it was a dirty word. Some might find some of his terms offensive but being elderly, gives him a pass. Tate, I'm thinking you might be elderly. Not a concern because a) he doesn't do online and b) nothing much offends Ed. This story reminds me of the stories of the OLA fire. Yes. It does remind me of the Our Lady of the Angels fire in 1958. Many would say that with 92 students and 3 nuns dead the angels were not there that day in 1958. Ive researched the OLA firemany years. I think Angels were there as the CFD saved over 200 lives in less than 20 minutes.....a record that still stands today as the most people rescued in the shortest time by CFD. The archdiocese then got grandfathered in on not having to replace the sprinkler system, saved $-today they would have been sued to death and rightfully so. No separation of church and state with the Irish Cath Daileys and the diocese. If they came with their prayers after the fact I'd have spit in the Bishops face.